In October, CSIS launched its Reconnecting Asia project, which seeks to track the various initiatives by China, Russia, Japan, South Korea, and other growing Asian powers to reconnect Asia and Europe via old trade routes. These modern-day Silk Roads will use highways, railroads, ports, bridges, and pipelines to reduce the travel time between the two continents. The best known of these initiatives is China’s “One Belt, One Road” in Central Asia. This is an ambitious undertaking across 43 countries that encompasses 69 percent of the global population and 60 percent of global gross domestic product (GDP). The efforts to reconnect Asia with Europe will be one of the biggest forces shaping the next 30 years, bringing new markets, people, and resources into the fabric of the global geopolitical landscape. If successful, it will revolutionize logistics and create trillions of dollars in economic value through increased trade and economic activity. The United States has approached China’s One Belt, One Road initiative with some misgivings. In addition to the initiative itself, China has launched a new multilateral bank—the Asian Infrastructure Investment Bank (AIIB). Some in Washington view this as a direct threat to the existing multilateral development banks, of which the United States is either the largest or second-largest shareholder. The U.S. government, however, needs to consider how it can engage constructively in reconnecting Asia. The United States should seek to ensure that the soft infrastructure undergirding a reconnected Asia will support open markets and open societies with an even playing field for U.S. goods and services. There are six areas where the United States can directly influence the soft infrastructure in the reconnecting Asia footprint: leveraging U.S.-led financing in multilateral and regional development banks, trade deals such as the Trans-Pacific Partnership (TPP), securing bilateral investment treaties (BITs) and Trade and Investment Framework Agreements (TIFAs) in every possible country, ensuring that procurement rules incorporate life-cycle costs, completing all World Trade Organization (WTO) Trade Facilitation Agreement requirements, the use of the U.S. dollar as the operating currency, and English as the operating language across the footprint. All of these must be done in coordination with our bilateral and multilateral partners. The United States is the largest or second-largest shareholder for the three principal multilateral development banks (MDBs)—the World Bank, Asian Development Bank (ADB), and European Bank for Reconstruction and Development (EBRD)—that finance projects, make private-sector investments, provide advice to governments, and help establish standards across the reconnecting Asia footprint. Out of the 43 countries in the footprint, 22 receive EBRD project finance and another 22 receive ADB financing, with an overlap of 8 countries receiving both. The only countries without EBRD or ADB relationships are Iran, Iraq, and North Korea; and Iran and Iraq are members of the World Bank Group. These institutions will have important roles in facilitating the reconnecting of Asia through financing and influencing regulatory infrastructure. The three MDBs in addition to the International Finance Corporation (IFC) should all be directed to have strategies for the footprint. A special strategy is necessary given China’s expanding focus. Beyond finance, other regional organizations like the Asia-Pacific Economic Cooperation (APEC) forum and the Association for Southeast Asia Nations (ASEAN) have a role in crafting projects that meet global development standards and norms. The United States should also leverage its bilateral institutions, such as the Overseas Private Investment Corporation (OPIC), the U.S. Trade and Development Agency (USTDA), the U.S. Agency for International Development (USAID), and the Millennium Challenge Corporation (MCC), to ensure they each have a reconnecting Asia strategy. USTDA and OPIC will have important roles in enabling hard infrastructure, while USAID (with missions in 30 countries in the footprint) and MCC can assist in moving toward life-cycle cost infrastructure and carrying out the Trade Facilitation Agreement reforms to remove barriers at customs and borders across the 43-country reconnecting Asia footprint. The reconnecting of Asia will require massive public-sector procurement and complex decisions by national, subnational, and city governments. In many developing countries, 25 to 30 percent of GDP passes through public-sector procurement. It is in the U.S. interest and in the interest of other Organization for Economic Cooperation and Development (OECD) countries to move from a low-bid to a “life-cycle cost” paradigm to ensure better infrastructural connections. Under a low-bid paradigm, Chinese firms could win most contracts, as their infrastructure firms can deliver services and products more cheaply but often with less quality than what can be produced by OECD countries. Moving to a life-cycle cost paradigm will require bilateral assistance to train public-sector officials on a new approach. Procurement standards should center around a holistic approach that evaluates more than cost concerns. Ideally, these standards would reflect the newly adopted World Bank procurement guidelines. To meet these procurement guidelines and build sustainable, reliable infrastructure, Japan’s “quality infrastructure” concept should be applied. Japan focuses on five aspects of the essence of quality infrastructure: economic efficiency in a low life-cycle cost, safety, resiliency against natural disaster, environmental consideration and social impact, and contribution to local society and economy. The Japanese model focuses on win-win relationships in development that build capacity through partnerships in developing countries. The United States is negotiating a trade deal with the eastern bookend nations of the initiative. TPP is a proposed trade agreement among 12 countries in the Pacific Rim and the Americas; the deal notably excludes China. TPP would lower tariffs, enforce labor standards, and encourage innovation across the free trade zone. TPP, however, does not extend far into the territory included in the reconnecting of Asia, only affecting periphery countries in Southeast Asia. The reconnecting of Asia phenomenon gives the next U.S. administration an additional reason to pursue TPP. The new administration should not abandon the deal and rather should support the deal as it allows U.S. consumers access to cheap goods and U.S. firms access to new markets. The United States has only a few other trade deals with other countries in the footprint. For example, the United States has 15 BITs across the footprint. BITs help ensure private investment regulation and dispute resolution. Beyond the regional free trade zones, the United States should carry out BITs with the other countries in the footprint, particularly with the five ‘Stans (Kazakhstan, Kyrgyzstan, Tajikistan, Turkmenistan, and Uzbekistan), Eurasia, and the Middle East. BITs and other trade instruments—including TIFAs, which the United States shares with over half of the footprint—serve as the groundwork for future economic and political relationships. In 2013, the WTO approved the Trade Facilitation Agreement (TFA) to expedite the movement of goods through customs and across borders. Improving border efficiencies could increase total trade by $1 trillion, and reducing trade facilitation costs could increase world income by $40 billion. The so-called Category C process is especially helpful, including updates to technical assistance capacity, plans for improving those considerations, and implementation dates of improvements. Category C in the WTO TFA is a list of asks from least-developed countries for technical assistance from wealthier countries. Category C helps countries achieve negotiated global standards, deliver advice, and implement technical improvements and reforms required under the TFA. The process could take 10 years between TFA acceptance and final implementation of Category C measures. Total trade costs are expected to drop by 14.5 percent in low-income countries under the TFA. Currently, global export and import procedures take between 6 to 86 and 4 to 130 days, respectively, requiring 2 to 17 documents. The TFA aims to streamline that process, reducing costs, bureaucracy, and time. Two-thirds of WTO members must domestically ratify the contents of the TFA before its stipulations around free trade come into effect. 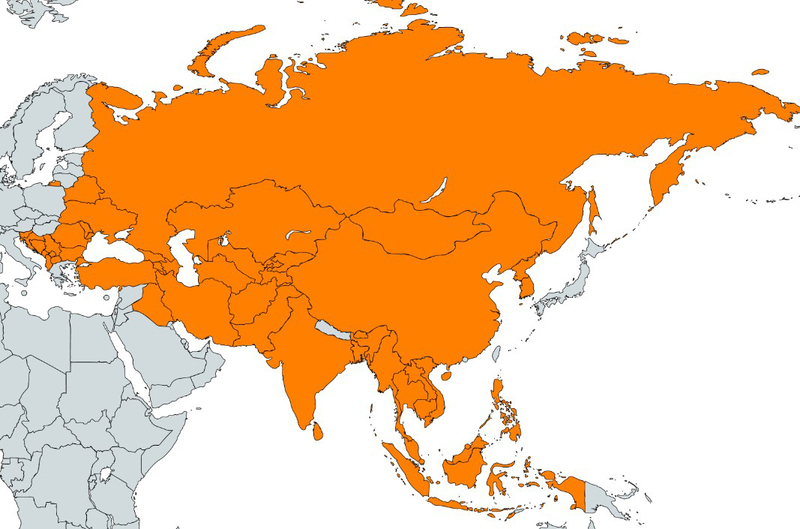 Across the reconnecting Asia footprint, there are 14 WTO members that have not ratified the TFA. The United States should encourage ratification in these countries bilaterally, through its allies Japan, India, and South Korea, and the WTO. Countries seeking Category C assistance must notify the WTO of their request. To date, Georgia is the only country in the footprint to make a Category C request. The United States should encourage more to make that request to jumpstart development capacity. English is the lingua franca across the globe. But given the growth of other languages, the United States should focus on ensuring that English remains the standard across the reconnecting Asia footprint. It is by far the most studied language, with 1.5 billion learners worldwide, followed by French at 82 million. Chinese, however, at 1.39 billion, has the most native speakers. That is over two times the number of English speakers. English as the underlying language of business and government across the globe is advantageous to the United States. Even right next to China, English is the working language of a series of organizations across ASEAN, APEC, and the South Asia Association for Regional Cooperation (SAARC). Using a common language helps to clarify contract language, responsibility, and dispute resolution. Since English is already the operating and working language in most economies and countries, the United States should continue to push for its usage. It is in the U.S. interest for the U.S. dollar to be the operating currency across the reconnecting Asia footprint. The currency remains the global standard and reserve currency. Even the AIIB lends in dollars. The reconnecting of Asia, however, could weaken the dollar’s primacy if the renminbi becomes a convertible currency. Then the AIIB could stop denominating in dollars, and access for U.S. firms would become more complex. At the moment, however, there is no currency that can replace the dollar. The above plans require partnership among U.S. allies. The United States has deep bilateral ties with Japan, constructive trilateral ties between Japan and South Korea, and a strategic dialogue with India. The sheer number of U.S. allies and institutions already operating in the region is an advantage for the United States. The United States should be looking at the phenomenon together with these partners and allies. This will be a new permanent lens through which the United States and its allies need to think about how the world is evolving. South Korea and Japan, however, have different approaches to the reconnecting of Asia that will need to be reconciled. The United States can play a role in getting a variety of these partners on the same page about how to reconnect Asia. Asia is in the process of reconnecting. Although this process will be incremental over 20 to 30 years, it would be a mistake for the United States to ignore this massive global change. The United States and its allies have an important role in shaping how Asia reconnects through soft infrastructure. Across the trade and development relationships examined, the United States has the deepest economic engagement ties (see chart below) with Mongolia, Georgia, Indonesia, Kazakhstan, and Kyrgyzstan. The lowest number of U.S. ties are with North Korea, Iran, Bhutan, and Slovenia. It is interesting to note that Iran, given its strategic geography, has the most projects in the reconnecting Asia footprint. The new U.S. administration will have a number of decisions related to reconnecting Asia presented to it, including whether to support TPP. A reconnected Asia, featuring quality infrastructure, high English proficiency, and efficiently transported goods, creates an opportunity for the United States to practice partnership, not development assistance, in a rapidly growing region. 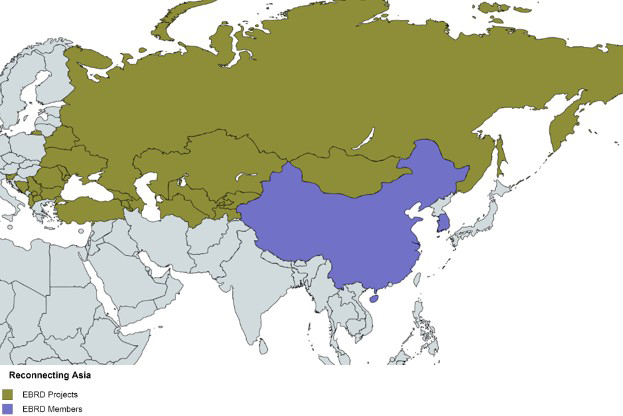 If U.S. policymakers pay a small amount of attention to the reconnecting of Asia, work in partnership with allies in Europe and Asia, and leverage the power of the MDBs, especially the EBRD, the United States has a chance to create a level playing field for U.S. goods and services as hundreds of billions of dollars are spent. The reconnecting of Asia can happen in ways that build on the current global system, as opposed to creating the underpinnings of an alternative global system. Most countries in the reconnecting Asia footprint prefer U.S. world leadership. Indeed, a Pew study found most countries in Asia prefer the United States as a regional superpower over China. The door is open for the United States to influence the soft-infrastructure of this emerging system. Daniel F. Runde holds the Schreyer Chair in Global Analysis and is director of the Project on Prosperity and Development at the Center for Strategic and International Studies (CSIS) in Washington, D.C. Aaron Milner is program coordinator with the CSIS Project on Prosperity and Development.